The fieldwork is done and now the time comes for the next phase of the process… proposal writing! This summer, I spent the month of July in Thule, northwestern Greenland (you can access my older posts here). I sampled large, glacially-transported boulders for cosmogenic dating as well as marine shells for radiocarbon dating. Now, my task is to obtain the funds to support the analytical costs of processing and measuring the samples. 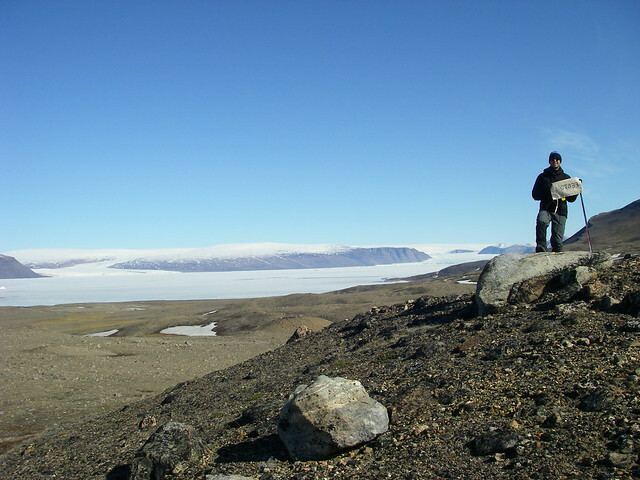 View towards Wolstenholme Fjord and North Ice Cap in Thule. A spectacular area! 1.) How old are the sediments? Were they deposited during the most recent glacial period, or are they a product of an older glaciation? 2.) What is the surface history of the sediments? How long have they been exposed, and do they record times of burial by non-erosive glacial ice? 3.) How erosive was the glacial ice that covered the landscape? Was it an effective agent of change, or was it non-erosive and capable of preserving a relict surface? 4.) What body of glacial ice deposited the sediments? Were they deposited by the Greenland Ice Sheet or by a small outlet glacier during a subsequent re-advance? A gorgeous (and very large) glacial moraine near Thule. How old was the ice advance that deposited this moraine?? Hopefully I’ll be able to answer that question later this year! Through my exploration of these questions, I will address not only the history of the Thule area, but also fundamental questions about the landscape evolution processes at play. 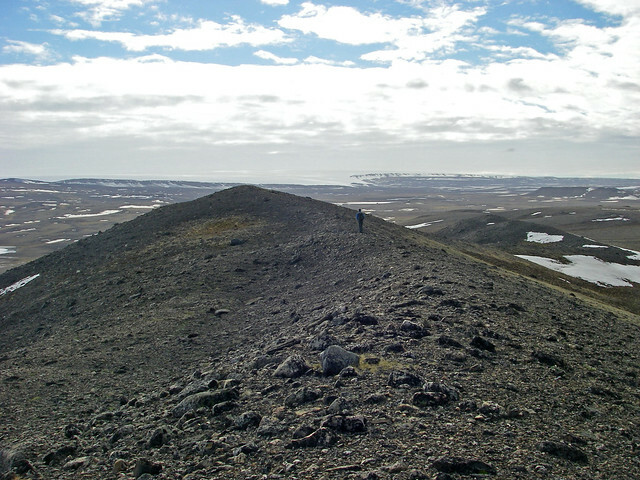 Because the area around Thule is complex both spatially and temporally, it provides an ideal opportunity to study a wide range of processes that drive landscape evolution at high latitudes. The process of writing this proposal has been a very valuable learning experience for me. It has encouraged me to think about the larger significance of my work; in essence, taking my work from a “postage stamp” project (i.e. one that addresses a small, specific area) to a larger and more relevant project addressing ideas that are widely transferable to other areas. I look forwards to learning more about high-latitude landscape evolution over the coming year! Panoramic view across the Thule landscape, looking towards Wolstenholme Fjord (photo courtesy of my fabulous field assistant Everett Lasher). After a very successful three weeks of work in northwestern Greenland, it was time for Everett and I to say goodbye to Thule. We shipped home boxes of rocks (which elicited several questions from the Air Force Post Office personnel), parted ways with our trusty Toyota Hilux (after a much-needed trip to the truck wash), said goodbye to the many friends we made during our stay on base, and boarded a New York Air National Guard LC-130 for our trip home. A fun hike up Mt. Dundas on our last day in Thule. The sea ice finally broke up on July 15. On our way up to Thule, we flew directly from the US with the Air Mobility Command. On the way home, however, we flew with the National Guard through Kangerlussuaq, where we had a two-night layover. Two very wonderful things happened during this trip home: first, I got to ride on the flight deck for my birthday; second, we met up with this year’s IGERT group in Kangerlussuaq. The flight from Thule to Kangerlussuaq was spectacular. I immediately announced to the Air National Guard crew that it was my birthday (which it was), and was thrilled when I got an invitation to ride on the flight deck for the last ~45 minutes of the trip. We requested permission to fly line-of-sight, then dropped low into the fjord for an absolutely amazing ride. The views were incredible, and we even passed right above the heads of a big herd of musk ox. I have an excellent track record of scoring special flight privileges on my birthday in Greenland, and this was no exception. The six passengers in the cargo bay may have become slightly air sick, but it was a small price to pay for such a ride (easy for me to say!). 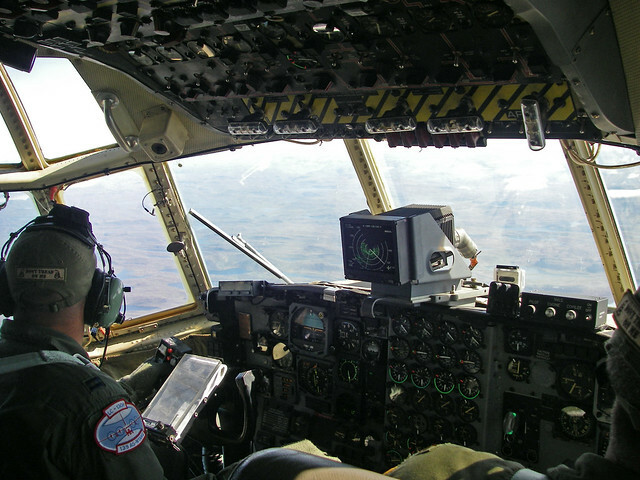 Flight deck of the LC-130 on the way from Thule to Kangerlussuaq. Best seat in the plane! We were only in Kangerlussuaq for a day and a half, but it was wonderful to be reunited with friends from IGERT Cohort 4. Developing this extended family of scientists has been a huge benefit of participating in the IGERT program, and I can’t describe how happy I was to have my layover in Kangerlussuaq coincide with the 2013 field seminar. We celebrated my birthday in style with burritos and ice cream after we arrived, then filled the next day with a long hike and a celebratory dinner (since the IGERTs just completed a very productive stay at Summit!) at the only restaurant in town. 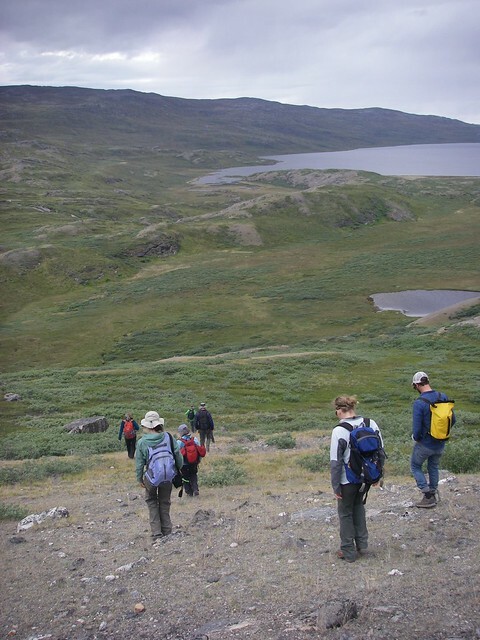 IGERTs hike down towards Lake Ferguson after a full day on the trail in Kangerlussuaq. Thank you to Mary, Ross, Matt, and all of Cohort 4 for letting us finish our trip on such a high note and in such good company! Best of luck on the rest of your trip in Kangerlussuaq, Nuuk, and Ilulissat. 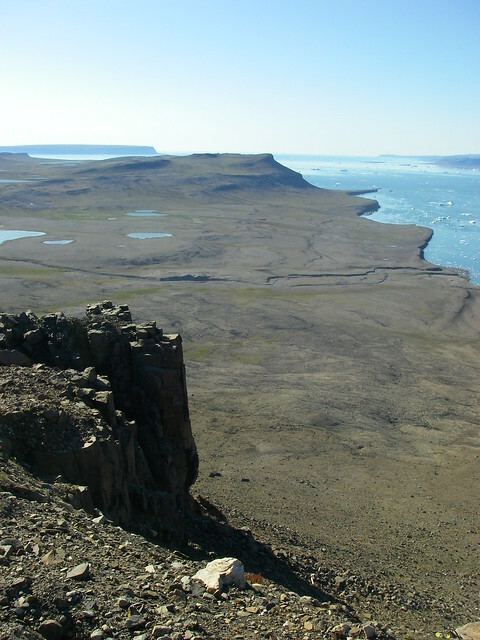 In an earlier post (Reading the Landscape), I described how we study landscape features in northwestern Greenland to try to reconstruct past events. For example, we can use glacial moraines to make inferences about the extent of past re-advances of the ice sheet or its outlet glaciers. This type of work focuses on the larger perspective: the landscape as a whole. This past week, we’ve shifted out focus to investigating specific areas in much more detail. In particular, we dig pits in the ground and study the sediments we find; we call this studying the stratigraphy. Reading a record of past sediments is similar to reading an ice core: sediments get laid down progressively over time, with the oldest sediments being on the bottom and the youngest sediments being on the top. We can use the sequence of sediments to make inferences about how the area has evolved over the recent geological past, since the end of the Last Glacial Period. 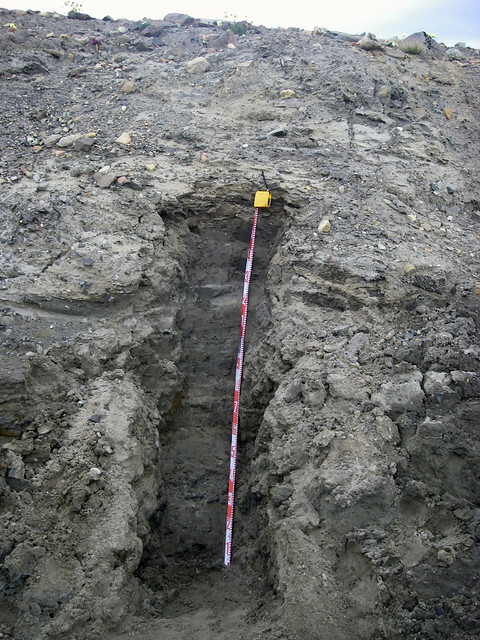 A big excavation project: we dug this 1.5-meter tall section into a stream bank near the fjord in Thule. Some of the areas we excavated have yielded an interesting story. The sediment on the bottom appears to be mostly silt and contains an abundance of marine shells. On top of that is a thick sequence of nicely layered sands; these layers are sometimes folded or truncated. The top unit in the sequence is an unlayered sandy material with abundant large rocks that appears to be glacial till. We found shells! 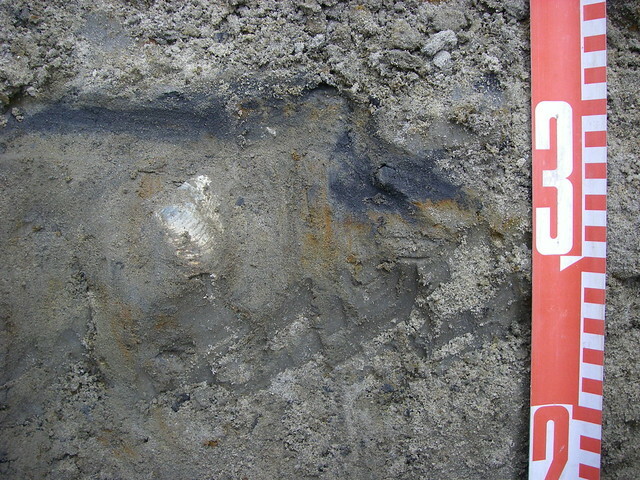 This one was embedded in the silty/sandy material ~30 cm from the bottom in the section shown above. My mission, after returning home from Thule, is to analyze the data from this work and try to unravel the sequence of events. For example, one possible scenario is that relative sea level was higher after the end of the Last Glacial period, depositing the shell-rich and sandy layers in an area that is now 20-30 m above present-day sea level. Later, the glaciers in the fjord re-advanced over the marine sediments and covered the landscape in glacial till. In addition to interpreting the sequence of sediments, we can also use radiocarbon dating to determine the age of the shells and cosmogenic dating to determine the age of the boulders in the glacial till. 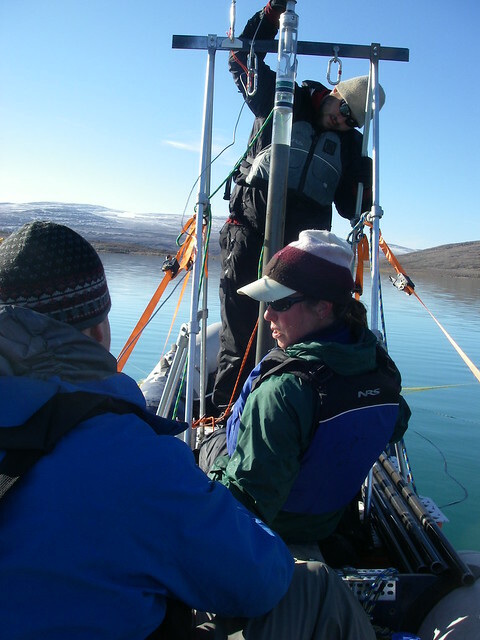 Using these techniques will allow us to understand how the landscape in northwestern Greenland has evolved during the present interglacial period. I’ve now been in Thule for two weeks, and we’ve battled pretty nasty weather the majority of the days. According to the meteorologist on base, the “Polar Vortex” has parked itself right above Thule and is refusing to budge. This means that we’ve been inundated with thick fog, wind, cold temperatures, and a delightful mix of horizontal rain, sleet, and snow. From a scientific perspective, this has been a bit of a bummer since it’s limited the amount of work we can accomplish in the field. Attempting to sample boulders in 60-knot winds and heavy sleet. Note the angle that Everett has to stand at in order to avoid getting blown off the moraine. However, one of the most important lessons I’ve learned this summer is that bad weather can also open up a lot of other possibilities. Being grounded on base has forced us to shift our focus away from our own work, and has given us the opportunity to interact more with other scientists and military personnel. During our stay here, we’ve learned a huge amount from a group from Alaska, who is studying the effects of changing climate on tundra vegetation. We even got the opportunity to visit their study site on one very rainy afternoon. What a cool experiment this crew is running! The team of tundra gurus is attempting to simulate what climate conditions in Thule may be like in the future, and study how these conditions impact the vegetation. They have tundra plots that receive no treatment (these are the control experiments), plots that receive additional heat (to simulate a warmer Arctic), plots that receive additional water (to simulate a wetter Arctic), and plots that receive both additional heat and water. 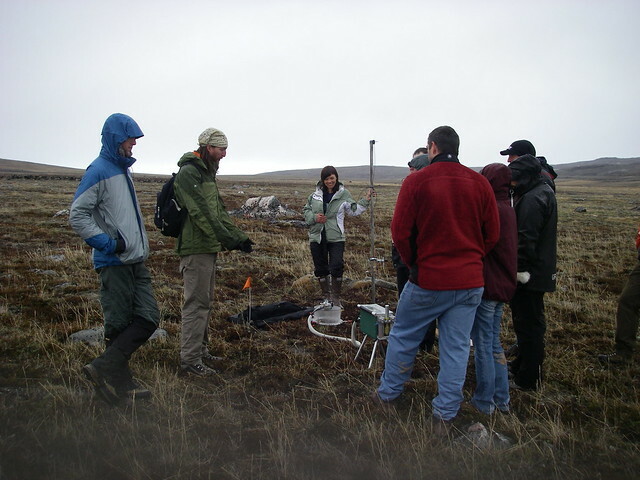 Their team is interested in quantifying how warmer and/or wetter conditions could impact tundra plant communities, and in particular whether this changing tundra vegetation would be either a source or a sink for carbon dioxide. I’ve really enjoyed following their work, visiting their site, and thinking more about where unique ecosystems like the one in Thule may be headed over the coming decades. A rainy visit to the vegetation plots. Here, Zach and Michele demonstrate the carbon dioxide measurements they make every day. We’ve also had the chance to get to know base better, and learn more about base operations. Thule Air Base has a very interesting history, and has been an important player in US defense since the 50s. One of its primary roles throughout history has been to house and support the 12th Space Warning Squadron’s radar system. Last week, we were fortunate enough to tour the radar system, and spent a very educational afternoon “geeking out” over all their neat electronic and scientific gear. I was amazed to learn that they track hundreds of thousands of objects in space. Their primary role is to provide early warning about ballistic missiles headed for North America, should such an event occur. However, they also monitor many of our orbiting satellites, and keep them safe from colliding with each other and with other objects in space. What a cool tour, and it certainly gave me a much different appreciation for the significance of Thule Air Base. So, despite the poor weather conditions, this field season has been hugely beneficial in terms of the intangibles. I’ve gotten to meet other scientists, learn about their work, meet various military personnel, and learn more about Thule’s role in US defense. This just scratches the surface of the experiences we’ve had on base over the past few weeks. My conclusion: if the Polar Vortex gives you storms, make “storm-aid” and take the chance to learn from all the smart, interesting, dedicated people around you. Hello from the land of perpetual winter! We’ve been in Thule, NW Greenland for about a week and have had a highly successful field season so far. That said, we were also quite surprised by the weather conditions when we arrived: it’s still so wintry! When we landed, we were greeted with snow on the ground, ice on the lakes, and a fjord still filled with sea ice. We’ve had a few spectacular days, but have also seen falling snow several times, including the first two days of July. We even tried to sample rocks in 60-knot winds and horizontal sleet. This is my third trip up to Thule, and is by far the latest spring I’ve seen. Most of the work we’ve been doing this week has involved looking closely at the landscape for clues about the past. Much of our time has been spent around a lake near Thule Air Base, which has a beautiful series of glacial moraines on one side and a nice set of wave-cut benches on the other. I hypothesize that the glacial moraines were deposited ~10,000-12,000 years ago, during a cold period when fjord-based glaciers re-advanced and covered part of the landscape. The wave-cut benches, on the other hand, likely formed after the last glacial period when the land surface was still depressed from the weight of the over-lying ice sheet and relative sea level was higher. By reading the landscape, mapping interesting features, and examining these features closely, we attempt to reconstruct a sequence of events that happened thousands of years ago! View of the landscape near Thule, where we’ve spent most of the past week. In addition to studying landscape features, we also try to determine how old these features are. This helps us to link them with climate events that may have led to their formation. The method I specialize in is called cosmogenic dating, which allows me to determine how long a rock has been exposed since it was last covered by ice. This method makes use of the rare isotope beryllium-10, which builds up slowly in a rock’s surface due to bombardment by cosmic rays. This week we have already collected about 25 boulder samples that will allow us to date the glacial moraines near Thule. 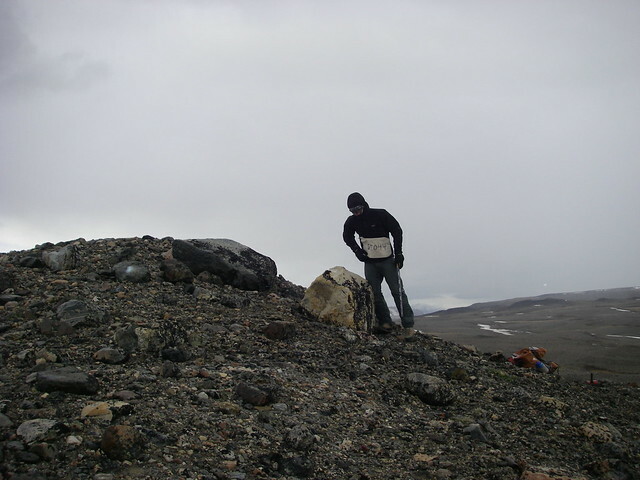 All-star field assistant Everett Lasher (PhD student, Northwestern University) stands with a boulder sample on a glacial moraine. Since today is the fourth of July, we took the afternoon off and celebrated in true Greenland style. 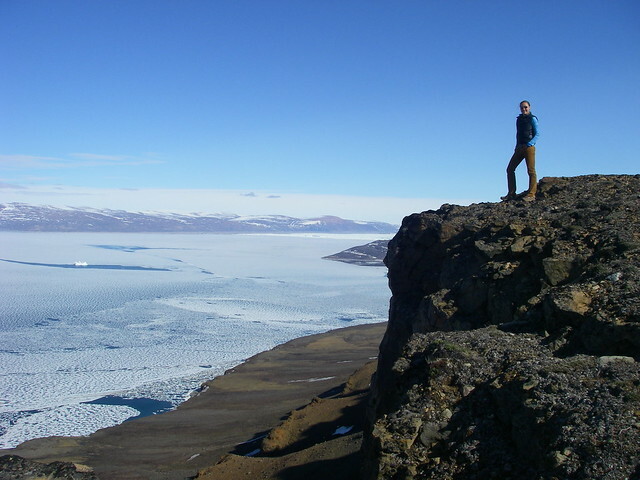 Along with some of the other scientists staying at Thule Air Base, we took a trip to an overlook that provides amazing views of the fjord and the glaciers north of Thule. The aptly named “Secret Place” is a secret worth sharing with friends! Despite the fact that this is my fifth trip to Greenland and my third trip to Thule, I was just as awestruck this afternoon as I ever have been on this very special, icy island. 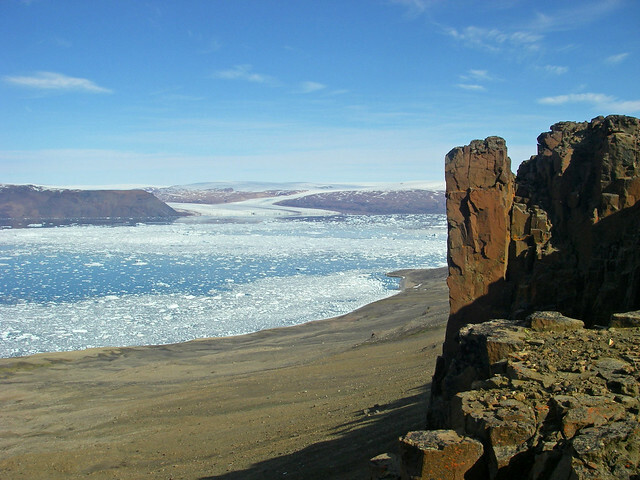 View from “Secret Place” north of Thule Air Base into Wolstenholme Fjord and towards the Harald Moltke Brae glacier. Greetings from the International terminal at Baltimore Airport! I’m currently waiting for my 2:00AM flight to Thule, Northwest Greenland and am excited to begin my third season there (and my fifth trip to Greenland!). 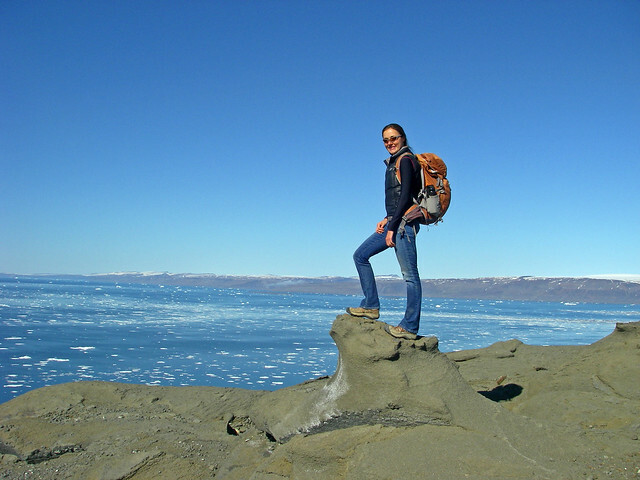 In 2011 and 2012, I blogged about our scientific ventures in Thule (click here to see my older posts). In a nutshell, our work there focuses on unraveling past climate changes, constraining both how temperature has varied and how the ice sheet has responded. Now, I’m on my way up to Thule to continue our work. For the next three weeks, I’ll be primarily focused on mapping the surficial geology of the landscape, and collecting rock samples in order to determine the age of the landscape. This season is particularly exciting since the team consists solely of myself and Everett Lasher, a PhD student at Northwestern. We’ll continue to provide updates as our work progresses, so stay tuned! The Thule field team is now home, and happy to report that we had a very successful field season. After some initial windy weather, the low-pressure system finally left the Arctic and gave us a week and a half of clear skies and bright sun. We managed to accomplish a huge amount of work. Highlights include collecting a shallow ice core from North Ice Cap, collecting 20 samples from bedrock and boulders for beryllium-10 dating, collecting lake sediment cores from several different lakes, and finding fossil plant material melting out from the ice cap margin. 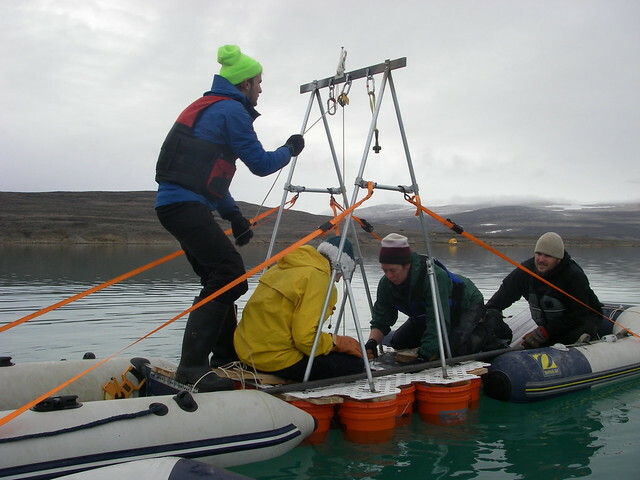 Team Thule collects a shallow lake core from “Delta So”, a lake near the margin of North Ice Cap. From left to right: John Thompson, Ellen Roy, Meredith Kelly, and Matt Bigl. Although there are many components of our project, we hope to use a variety of different methods together to understand how North Ice Cap has behaved over the Holocene (the past ~11,000 years). In particular, we’re interested in how the extent of the ice cap has changed over time. Did it grow during cold periods and shrink during warm periods? Has it been bigger in the past than it is now? If so, how much bigger? And maybe more fundamentally, how old is the ice cap? We’ll continue to explore these questions over the coming year as we analyze the samples and data collected during this field season. Team Thule admires a long lake sediment core extracted from “Delta So”. We hope this core will tell us about how the ice cap margin has behaved during the past. From background to foreground: Matt Bigl, Meredith Kelly, and Erich Osterberg. Although we worked hard in the field, we also had the opportunity to admire our surroundings and appreciate how fortunate we are to work in this area. The last lake we camped at was particularly beautiful; this ice-marginal lake had a large calving margin, and we were routinely entertained by calving events which sent small tidal waves and ice bergs by our tents. 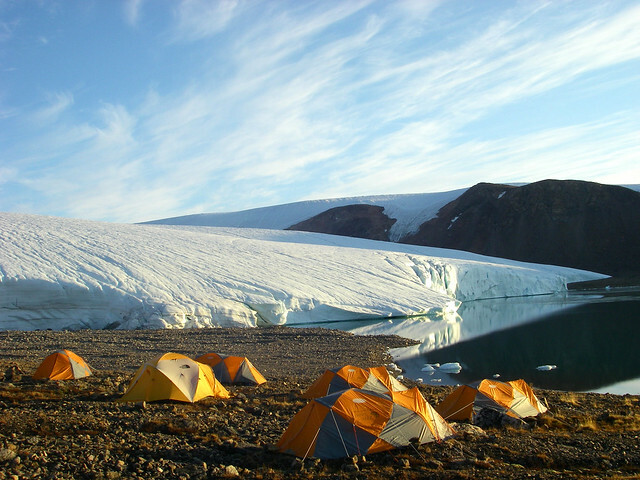 Our last camp, right at the margin of North Ice Cap. Watch out for ice bergs! Overall, we had a very successful field season and I’m excited to be back at Dartmouth to analyze samples and interpret data. Thank you to my field team (Professors Meredith Kelly and Erich Osterberg, post-doctoral fellow Eric Lutz, MS student Matt Bigl, and undergraduate students Ellen Roy and John Thompson) for all their hard work, and to the field planning and logistics gurus at CPS (especially Kim Derry and Joe Hurley) for making everything happen. Stay tuned for some exciting results over the coming year!